We'll be back in mid-week as the Lions head south (a bit) to Auckland to face Super Rugby enigmas the Blues. The game kicks off at 08:35 BST and we'll be live an hour before the start to ease you into the humpday in your working week. In the meantime, you can read Caroline Chapman's report here, while we'll have full reaction from the camp a little later today, plus Jeremy Guscott's view. Better to come from the Lions? Thanks for joining us for what was, admittedly, a rather downbeat tour opener. Play like that from now on and the Lions probably won't win another match in New Zealand. But the chances of them playing that poorly again must be remote. A few more days' training, the jetlag having finally disappeared and a higher standard of opposition will surely see the Lions raise their game. Won't it? Well if the Lions didn’t realise the magnitude of the task they face, this game will have brought that into sharp focus. Against a team of fringe Super Rugby players this should have been a relatively straightforward task, even though the Lions were always going to be less than perfect as a scratch team fresh off the plane. On the plus side 23 players got a workout and the Lions didn’t lose, but it’s hard to take much more from the game than that because the New Zealand Provincial Barbarians were the better side for much of the game. Make no mistake this was the easiest of games to start the tour and the standard of opposition will sky rocket from here. 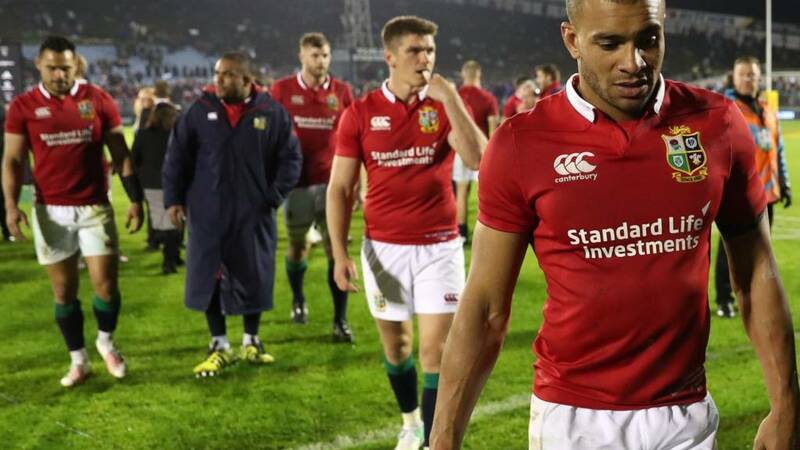 The British and Irish Lions are unbeaten in New Zealand… for now. Po: people of New Zealand please accept our apologies for the sorry shower we have sent over to you. Try not to humiliate us. Chris Darby: Thank goodness for the England tour. It'll be good to see some proper entertaining rugby after that omnishbles. Lions captain Sam Warburton speaking to Sky Sports: "One out of one. I am pretty pleased with that. At least we now have some footage to work on defence and attack. We kept letting them back in the game with penalties, giving them easy outs. Every time we play it is a dress rehearsal for the Test match, the fans here wanted to see a spectacle but we want to focus on that." And that is before the Lions even make it the Test matches. They need to step up immediately, because the learning curve is K2-style steep on this tour. Mako Vunipola with a prize piece of cat burglary, crabbing round and wrapping up the loose ball at the back. Owen Farrell's booming kick is good, long and into touch. But the Provincial Barbarians take the quick one, the Lions infringe at the breakdown and the hosts kick up to just outside the Lions 10m. The Provincial Barbarians kick into the 22m. A knock-on from replacement fly-half Joe Webber gives the Lions put in to the scrum. They need to execute a good exit strategy to make sure there is no nervy conclusion to a match that was supposed to be a walkover. A few calls go against the Lions. "The referee's a hero," chants one local wag. Justin Tipuric knocks on as the Wales flanker attempts to strip the ball in the tackle. It’s always difficult to marshal a new team from fly-half but Johnny Sexton struggled to find any flow to his own game in the Lions opener, and if his form doesn’t improve it could open the door for Owen Farrell. Farrell made an immediate impact off the bench with a tactical kick and then changed the tempo in attack to create Watson’s try, although he missed a relatively straightforward penalty. It’s probably advantage Farrell at the moment but Sexton is a man who loves a challenge. The Provincial Barbarians have sniffed an upset in the offing. They are up to the Lions 22m with just six points seperating them from the tourists on the scoreboard. Mass booing from the home fans as Farrell went for goal, but trying to take the lead to two scores probably the right call. Either way, execution from the Lions has been sub-par. Ross Moriarty looks like the wear and tear of this opener is starting to tell. He is a little slow to his feet and looks like he is nursing a knock. The bench has been pretty much emptied though. Neat whisky: please stop talking about test places already! But that's all part of the fun...! Owen Farrell has brought an accuracy to the Lions play. A laser-guided up-and-under bomb is perfectly weighted for his chasers as it zeros in on the hosts' 22m. Justin Tipuric pouches it, flips the ball out of the side-door, but Rhys Webb is hauled down just short.